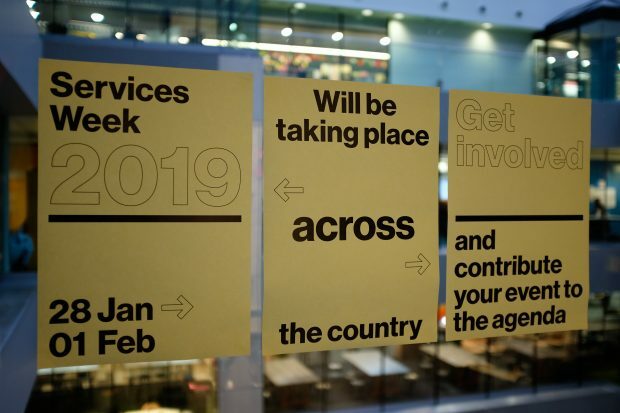 We’re planning the first ever Services Week – a series of cross-government events that will look at how we can work together to deliver end-to-end user-focused services. At GDS, we’ve been doing a lot of work this year to help make government services better. This includes launching the GOV.UK Design System, developing step by step service journeys on GOV.UK and preparing to publish the new Government Service Standard. A big part of this work is about helping teams across government work with each other, so that we can deliver whole services for users. This is why we’ve been working on projects like Service Communities, which bring together everyone involved in delivering a service, regardless of their role or department. And it’s why we’re planning the first cross-government Services Week – which will be held 28 January to 1 February. And we need you to help us deliver it. Services Week will be an opportunity to talk about end-to-end services and, in particular, how we can work together across government to deliver these services for users. Services Week will take place across the country and there will be show and tells, workshops and meetups. We also hope that people will deliver remote presentations and publish blog posts throughout the week. But we do not know exactly what will happen yet, because we’re leaving the final agenda up to the participants – which is where you come in! Services Week will be a cross-government series of events in multiple locations throughout the country. The User-Centred Design team at GDS will provide resources and a framework for the week, but the agenda and all the events will be generated by the people taking part. This means departments and organisations can use the week to talk about whatever aspect of whole services they want. Services Week will be what departments and organisations want it to be – at a time and place convenient for them. You might decide to run a show and tell about your work, organise a meetup of designers in your area or stream a remote case study presentation. It’s entirely up to you. GDS is producing a series of resources to help you run and promote your events. These include pre-packaged workshop ideas and guidance on how to run a workshop and poster designs, which you can download and print out to promote the week. And you can also join in the conversation on social media using #servicesweek. You can contribute your event to the agenda and follow it as it develops over the coming weeks. Alternatively, you can view the published version and email us to add your event. If you’re interested in getting involved, please complete the expression of interest form and please email us if you have any questions or comments. Is this just for central government departments? What about local government? Hi Malcolm – most events during Services Week are open for both civil servants and public servants. This includes training, meetups, remote case study presentations. These are open for public servants, people working in the NHS and local government. For some training, we even reserved extra spots for people from local government. Some intra-departmental show & tells might be not accessible, but that should be the exception. Some of these links are blocked in the DWP, any chance alternatives can be posted? Hi AK Hilton - if you paste the link into an incognito window you should be able to access the materials. Alternatively, you can also open the links on your mobile over 3/4G. Services Week sounds good, but that week includes the HMRC self-assessment filing deadline (31st January) which is by far the busiest time of the year for many working for HMRC. I'd be happy to run a design crit day here in Birmingham during this week if there is support and willingness for people to get involved and take part.